Ok you're not alone! And here's great news for you and me! You do know Bobby Flay, don't you? Of course you do! 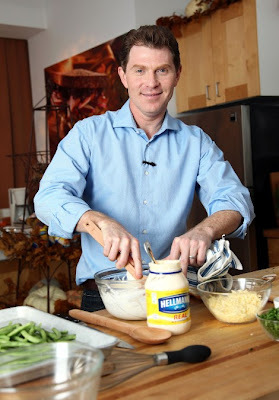 Well, Hellmann's® and Best Foods® Mayonnaise has teamed up with this critically acclaimed chef, author and TV personality to create the Real Holiday Helpings program filled with great recipe resource for us moms on how to recycle leftovers into sumptuous dishes and easy to make holiday recipes! Its' like having your own personal little elf helping you out. I should tell you that I've already printed out (yes, they're printable) several recipes that I wanted to try. Just thinking of the Turkey Fajitas with Creamy Avocado Sauce is already making me salivate. Yum! And I should tell you too that the site is addictive. Not only do you get awesome recipes, watch outstanding how-to-videos but you also get tons of fun playing the match-up game while being entered to win fabulous prizes! How does $50 Grocery Gift Card and FREE GROCERIES for a year sounds? Is that cool or what? If you couldn't guess, I'm going to be a constant visitor of the Real Holiday Helpings program site for a while! Now let's up the ante of coolness by giving away a $25 American Express Gift Card to one of my fabulous readers right now to help you with your own holiday shopping too courtesy of Hellman's Real Holiday Helpings program . Are you game?! Alright! a- Visit Real Holiday Helpings program and tell me which recipe you'll try. 4- Tweet about the Real Holiday Program & Giveaway each day. No limit. Good Luck everyone! And make sure you leave a valid email address so I can notify you if you are the winner. Contest will run from Dec 3 to Dec 10, 2009 @ 12 AM EST. *A $25 American Express Gift Card was received as part of Hellman's Real Holiday Program and sponsored the giveaway via Mom Select. Definitely the Cesar Salad Crostini! I love Ceasar Salad! Thanks for your visit! What a great blog you have here! Well I don't have a twitter account, but I can sing you the rockin robin song...tweet a leeta leet, tweet a leeta leet. ha ha. I am going to make the succulent chicken parmesan, maybe even this weekend. YUM! Hi, me again. I've been thinking about your blog friend Anissa lately and could not remember where I saw her story. I'm glad you stopped by my blog again today so I could reconnect. Can you give me an update? I fear that she has passed away since the last update was on November 20? What a great idea...to recycle those leftovers into new and delcious dinners! Love it!! ...FANTASTIC and so LIVELY and highly INTERESTING your writing and DESIGNING!!!!!!! It's not the first time I look in and I will love to come back!! Thank you so much for stepping in my Tuscany and leaving this your lovely comment; I appreciated very much! I'd like to try the Celebration Cheese Spread recipe. Okay I want to try the Chocolate Mayo Cake only because it sounds a like you shouldn'tmake chocolate cake with mayo but would love to try. Totally want to make the Cuban-style corn! I'm now a Google follower. Subscribing via RSS and email.